When it comes to workplace safety, it’s always better to have established accident prevention measures than having to deal with an accident and its inevitable aftermath. Keep your employees always mindful of their actions by using safety signs. 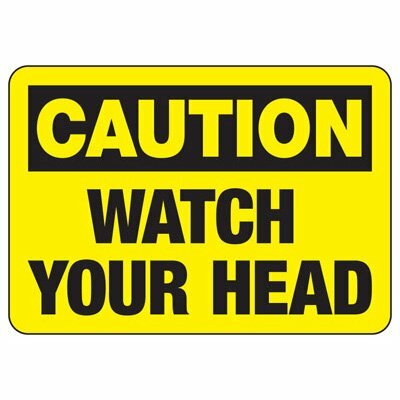 Part of Seton’s complete selection of work site signs, we carry Watch Your Head Signs to constantly remind your employees to keep watch of doorways, pathways, or stairs with low overhead ceilings to avoid accidents. Choose from a selection of standard overhead signs and OSHA approved warning and caution signs that you can use in and around your facility. Using safety signs to warn your employees against possible dangerous situations is a good start. However, your initiative to keep your workers safe may be in vain if you’re not using the proper signs. Make sure that your Safety Signs are large and conspicuous enough to guarantee that everyone will take notice of it. Here at Seton, we carry extra large and heavy-duty caution signs that are perfect for outdoor use. With sizes ranging from 18”W x 12”H to 48”W x 36”H, you are sure to find the perfect sign to suit your facility’s requirements. Choosing the right sign and making sure that it is properly installed are two important factors if you want to maintain a safe facility. Improperly mounted signs would be of no use to anyone and can even cause more accidents. Make sure that your signs are posted where they are needed and are always securely mounted. Seton provides you with a vast selection of mounting options to make installation easier and faster. Our Overhead Signs come with self-adhesive vinyl backing or 4 pre-drilled holes for easy mounting. You can also check out our selection of sign posts and accessories that will go well with your chosen signs.